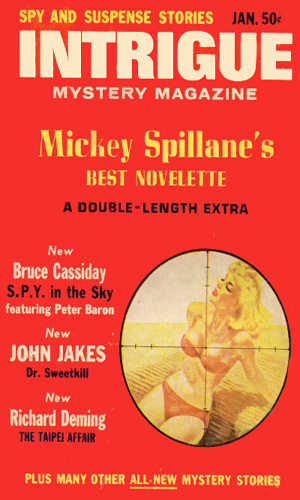 Originally published in Intrigue Mystery Magazine #3, January 1966. Peter Baron is on vacation on a yacht in Hawaiian waters when one of the volcanoes has a small eruption and a man caught in the boiling waters is pulled onboard. He is a scientist with no reason for being in the area but when Baron gets curious, he gets assaulted. Reprinted in the collection Cloak and Dagger, a treasury of 35 great espionage stories edited by Bill Pronzini and Martin H. Greenberg, 1988.